Asian carp jumping: Asian carp not only take over river ecosystems, but can furiously "fly" out of the water.Courtesy The Theater of Public PolicyPreliminary information from a study of river water DNA samples done two years ago cranked up concerns about the presence of Asian carp in Minnesota sections of the Mississippi River and also the St. Croix River. But new and deeper analysis of the data shows that the menacing fish haven't been regular residents of those waters, and that local authorities have plenty of time to plan ways of keeping the invasive species away. What changed? Last year researchers used more precise methods of identifying the DNA, they found that the earlier DNA samples were most likely not from Asian carp. It's all good news in the short term. 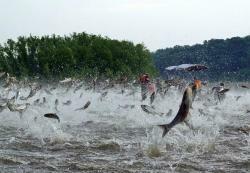 The Asian carp have been slowly migrating up the Mississippi River, upsetting the eco-balance of those waters for many years. The fish are aggressive and actually can "jump" out of the water and into anglers' boats. They also are aggressively eating foods that are the diets of native fish. This new information isn't slowing down plans to try to halt the spread of the fish upstream, authorities added. Among the plans are to install underwater noise and bubble barriers at the Ford Dam on the Mississippi River in the heart of the Twin Cities.